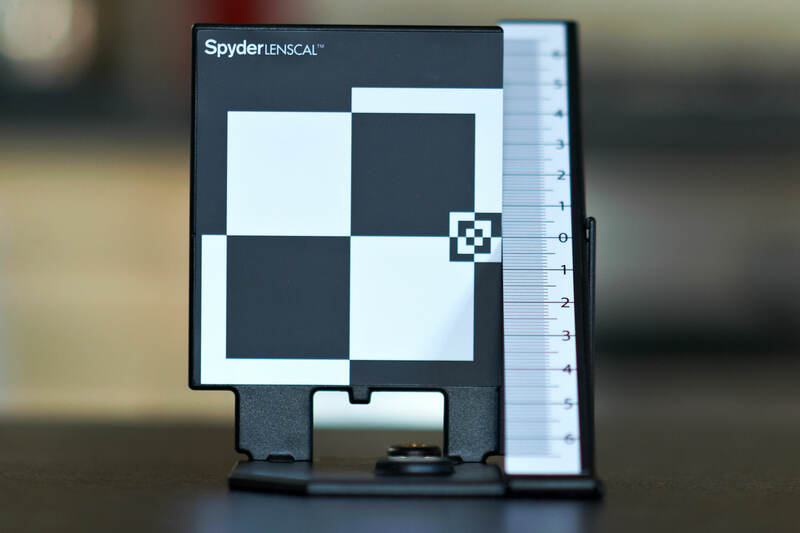 A device for assessing the accuracy of focus for lenses with a view to helping you to make accurate micro focus adjustments on compatible cameras. 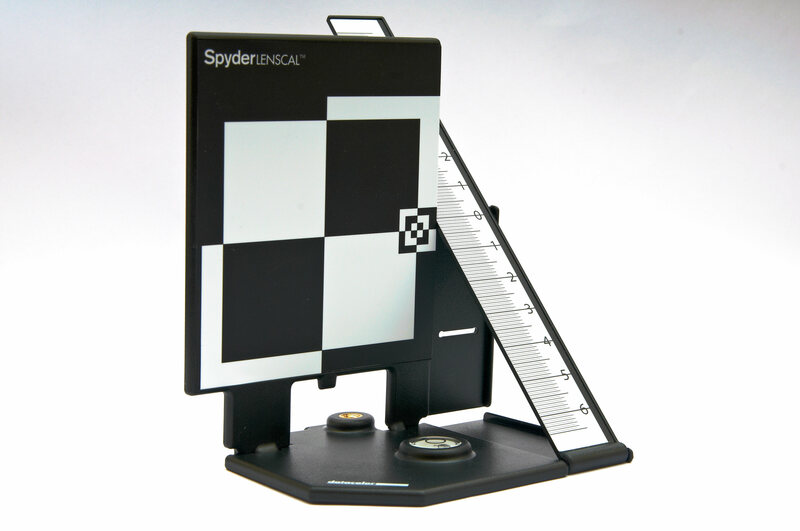 Gary Wolstenholme takes a close look at the Spyder LensCal. A device aimed at those who wish to make accurate focus micro adjustments on SLR cameras with that feature included. With today's autofocus lenses, for most people's requirements it will not matter how sharp the lens is, if it can't focus accurately. Many a horror story can be found of people having to try two or three copies of a lens before a satisfactory copy can be found. In my own experience I have known lenses that were once great, have become less accurate to focus as the years advance. In response to this, many manufacturers have added focus calibration features to their high-end SLRs, so that accurate focusing can be obtained without having to send your lenses off to be calibrated. 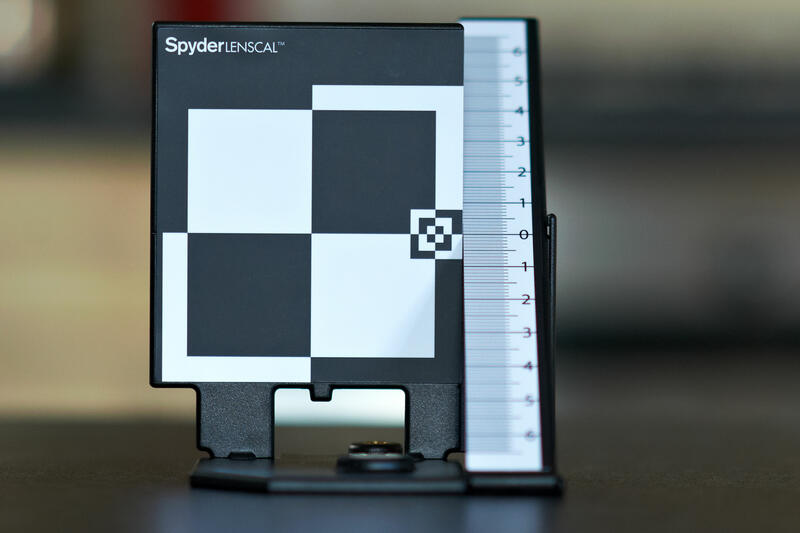 The issue here is that without an accurate, repeatable test for focus accuracy, you could end up making matters worse than they already were, which is where Spyder's LensCal device comes in. Costing around £50, it is aimed at advanced photographers who are unwilling, or unable to put up with focus inaccuracies. 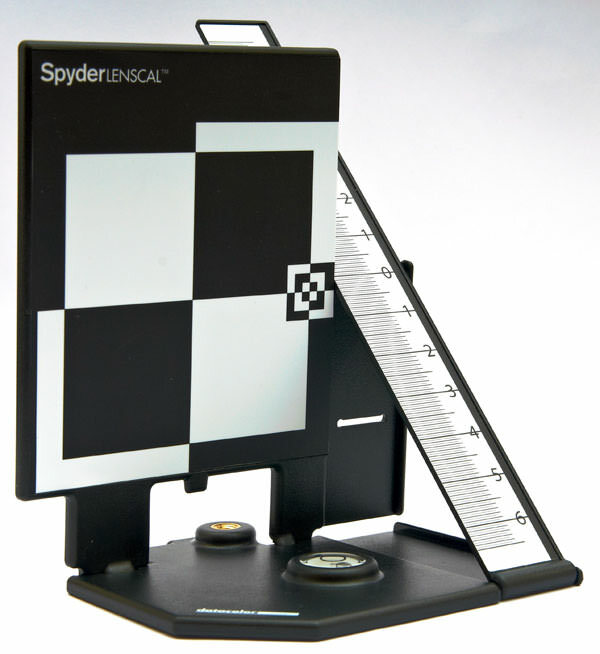 This may seem a little steep for what is essentially a piece of plastic with spirit level and a tripod mount included, but if it does its job, it could potentially save money on getting lenses calibrated, especially if they are out of warranty. To make the most of this product a digital SLR camera with some way to calibrate the focus system is required. Canon call their system 'Micro Focus Adjustment' and recent camera models from the 7D upwards have this feature. Nikon's version of this feature is called 'AF Fine Tune' and is present on recent cameras from the D300 upwards. The device works by providing an AF target, which needs to be set up level to the sensor plane. When the camera is focused to this, a sloped ruler, which lies at roughly 45degrees, shows whether the lens is focusing accurately to the surface of the AF target. The idea is, that the sharpest point is ahead of the target, your lens has front-focused and vice-versa. Having this information should than allow you to make the adjustment necessary and re-check the lens. In the box the LensCal device is packaged flat, and can quickly be set up by unclipping the ruler from the base and raising the AF target. 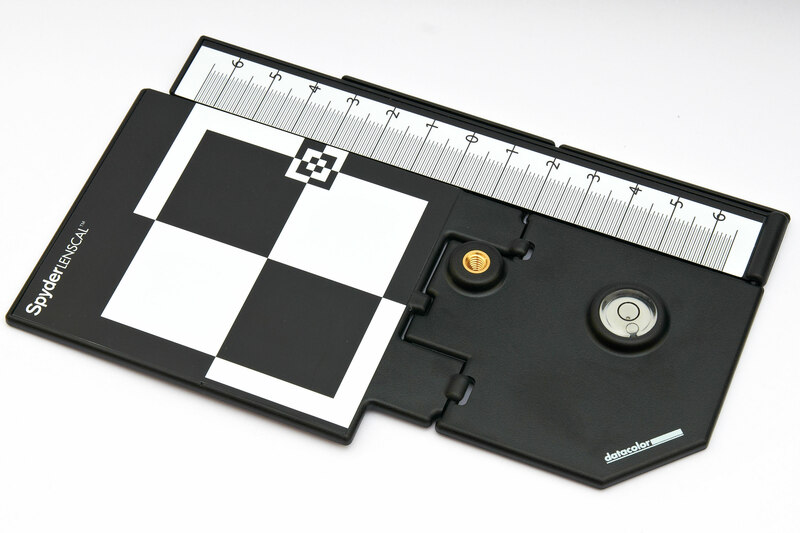 A spirit level is provided to ensure that the LensCal is set up square. I found it necessary to use a hotshoe spirit level on the Nikon D700 used for testing to ensure the camera was set up square too. A brass threaded hole is included for mounting on a tripod, although I found it easy enough to set the LensCal on a flat level surface during testing. The LensCal folds flat for storage. A spirit level bubble helps to ensure the device is set up properly. The testing process is simple. The camera needs to be focused on the AF target and a picture should be taken. 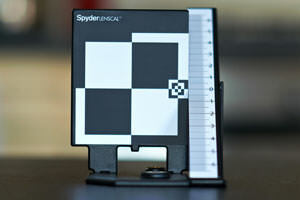 Examining the image on the camera's screen at full magnification should show whether the lens is focusing in front or behind the AF target, allowing you to make the adjustments necessary. To test the LensCal I used a variety of my own lenses in conjunction with a Nikon D700. To my surprise, only a couple of my lenses showed focusing errors (and I own some right old beaters!) so the reassurance alone was a pleasant bonus. Two of my lenses that showed focus errors were my Sigma 24mm f/1.8 EX, which was front focusing by quite a noticeable margin, and my Nikon AF 135mm f/2 DC, which I have always suspected of being a bit off but have never got round to testing. As both are wide aperture lenses, the depth of field is quite shallow, which should make it easy to see the point of focus. With the 135mm lens, this is certainly the case making the front focusing problem easy to diagnose and correct. An adjustment of +3 seemed to have the lens focusing much more satisfactorily. With the Sigma, the transition from in focus to out of focus is more gradual, so I found it more difficult to ascertain exactly where the point of focus was. Still I managed to diagnose the front focusing issues with this lens, which required the maximum +20 adjustment to get the focus point as close to accurate as possible. Front focusing can clearly be seen in this image taken with my Sigma 24mm f/1.8 EX. An adjustment of +20 was needed for more accurate focus. Again, front focusing is easily diagnosed by the Spyder LenCal. This time a more modest adjustment of +3 is needed to find the sweet spot. 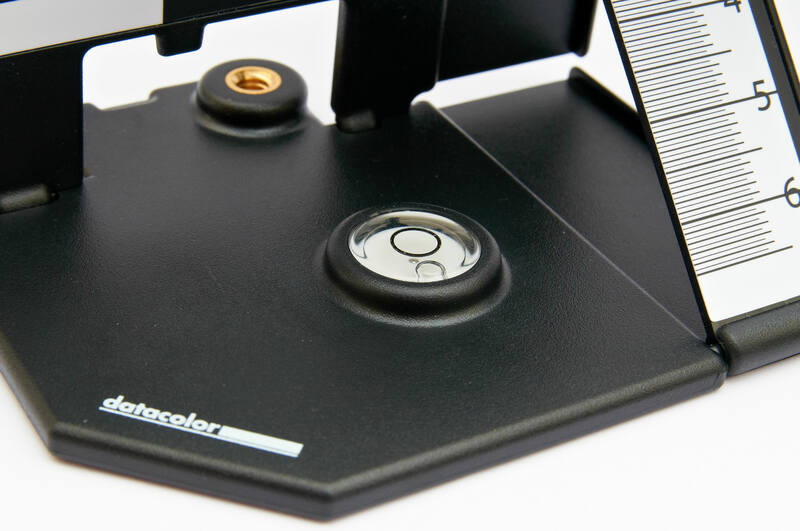 Although £50 may seem a little steep for what is essentially a piece of plastic with a spirit level, it could potentially save a fortune in service charges for getting out-of-warranty lenses calibrated. If like me, you own more lenses than you have fingers, then the peace of mind alone of knowing all is well with your equipment may be worth its while also. So long as care is taken to complete the testing process accurately, it is very straightforward, and easily repeatable, which is exactly what is required of a product like this. Still, I can't help thinking that this would be a much more appealing product if the price were just a little lower. The review rightly draws attention to the possibility of lens not being able to focus accurately. This device may work well as an AF target some of the time, but is unlikely to work well as an AF target all of the time - because the target is high contrast edges capable of fooling AF into focusing at a wrong distance. For guidance on why high contrast edges can result in wrong distance focus see example 2 of Getting good results using autofocus included in every Nikon DSLR instruction book since 1998. Chuck Westfall the number 1 at Canon USA has said - The nature of the AF sensors used by EOS digital SLR’s as well as those from other manufacturers is that they perform most reliably when the entire length of the focusing area sees readable detail. There seems little point in paying good money for an AF calibration target that consists of little more than a high contrast edge where the AF detection line would look for detailed information, especially as the high contrast edge may not be accurately detected by AF because of the high contrast edges. Having purchased one from the first, what the article doesn't say is about the distance between the camera and the Spyder Lens Cal. I first tried with both too close and it threw the calibration right out the window then tried with both too far away and had a job reading the scale. It is a case of trial and error to set both the camera and target at the correct distance and this depends on the lens being calibrated. I returned mine after finding there is no way to ensure the camera sensor plane is parallel to the target face. A must IMO for accurate calibration. [quote] It is a case of trial and error to set both the camera and target at the correct distance and this depends on the lens being calibrated. [/quote] It is usual to give a guide to focus distance in relation to focal length. About 25x effective focal length - 1.250 meters - with a 50mm on 24x36 - is a common standard. The problem with Gary Wostenholme's assumption plus 20 was needed with the Sigma is if the target was fooling the camera AF to focus at the wrong distance what was measured was focus deviation, not lens front or back focus. Gary obviously has good eyesight. The difference between plus 20 and nil is discernible in the viewfinder, and more easily zooming in in live view. A question for Gary - does the Sigma look unsharp in the viewfinder at nil? If yes it is obviously defective. If no the plus 20 is a focus target problem, not the lens. Quote: It is a case of trial and error to set both the camera and target at the correct distance and this depends on the lens being calibrated. It is usual to give a guide to focus distance in relation to focal length. About 25x effective focal length - 1.250 meters - with a 50mm on 24x36 - is a common standard. The problem with Gary Wostenholme's assumption plus 20 was needed with the Sigma is if the target was fooling the camera AF to focus at the wrong distance what was measured was focus deviation, not lens front or back focus. Gary obviously has good eyesight. The difference between plus 20 and nil is discernible in the viewfinder, and more easily zooming in in live view. A question for Gary - does the Sigma look unsharp in the viewfinder at nil? If yes it is obviously defective. If no the plus 20 is a focus target problem, not the lens. Quote:I returned mine after finding there is no way to ensure the camera sensor plane is parallel to the target face. A must IMO for accurate calibration. What I did was to measure the height to the centre of the lens and used that measurement to get the correct height on the target, thats on level ground obviously. Regarding the target being slightly facing left/right to the camera lens shouldn't make any difference to reading the scale as both extremes would be equal distance from the camera lens. Height and parallelism are both variables and both should be controlled to enable any meaningful focusing tests / adjustments to be carried out effectively. [quote] Regarding the target being slightly facing left/right to the camera lens shouldn't make any difference to reading the scale as both extremes would be equal distance from the camera lens. Realspeed[/quote] If I understand you correctly, I do not agree. The intention is that AF should accurately focus on the center of the target. Ignoring the risk that with such a poor AF target this may not happen, if the scale is slightly forward or behind the center of the target due to the target not being parallel to the sensor, front or back focus will be indicated. Any such indication will be due to the target due not being parallel to the sensor and is not caused by a lens or camera body issue. If you mean the target is parallel to the sensor but not on the optical axis then there is still a very slight affect on focus distance, likely to be less than plus or minus 1. Digressing if several lenses indicate a similar focus shift in the same direction the issue is likely to be with camera body calibration, not lens faults. 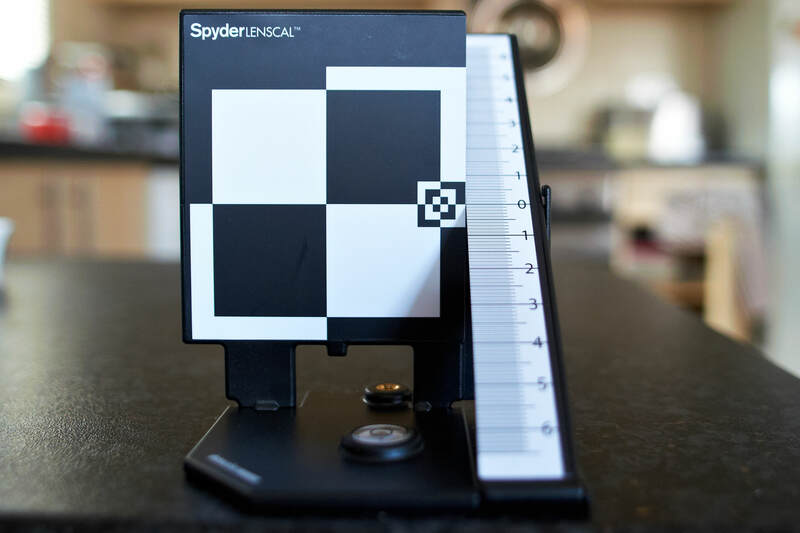 Quote: Regarding the target being slightly facing left/right to the camera lens shouldn't make any difference to reading the scale as both extremes would be equal distance from the camera lens. If I understand you correctly, I do not agree. The intention is that AF should accurately focus on the center of the target. Ignoring the risk that with such a poor AF target this may not happen, if the scale is slightly forward or behind the center of the target due to the target not being parallel to the sensor, front or back focus will be indicated. Any such indication will be due to the target due not being parallel to the sensor and is not caused by a lens or camera body issue. If you mean the target is parallel to the sensor but not on the optical axis then there is still a very slight affect on focus distance, likely to be less than plus or minus 1. Digressing if several lenses indicate a similar focus shift in the same direction the issue is likely to be with camera body calibration, not lens faults.